It's been a while since I've updated the Texas oil rumor list, so I took a crack at it this afternoon. The list is my attempt to aggregate wells subject to rumors that the operator might be drilling for an oil target below the Haynesville Shale. Various parties feel passionately conflicted on the subject. I am neutral, but I find it interesting nevertheless. Since I last updated the list in July, there have been 11 completions of rumored wells. But...all of the wells in question were completed at vertical depths above the Haynesville Shale, so I removed them from the list. I also removed a couple of others with similar characteristics. What is left is a handful of wells that are still suspicious. I think the majority are one day to fall of the list, but I'll reserve judgement until I have more concrete evidence. The pared back list is under the "Oil Rumor" tab at the top of the page. I'm glad I didn't rush home from my Thanksgiving trip to publish this batch of unimpressive completions, all of which are vertical completions. Labels: Completions, Haynesville Shale, Southwestern Energy Co. I'll update the spreadsheets and maps after posting another new batch of completions later this week. The weekly Haynesville Shale rig count dropped by two to 102. Louisiana decreased by five to 70, while Texas increased by three to 32. The weekly Baker Hughes U.S. rig count showed a one rig decrease to 2,000. 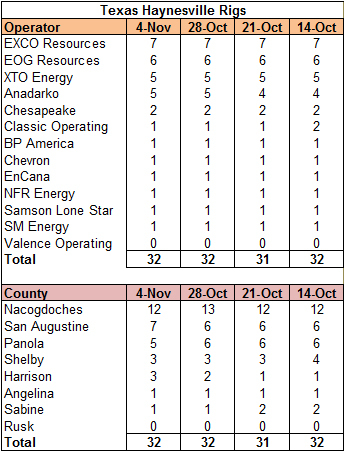 Oil rigs were up five to 1,030, gas rigs were down six to 865 and miscellaneous rigs held at five. 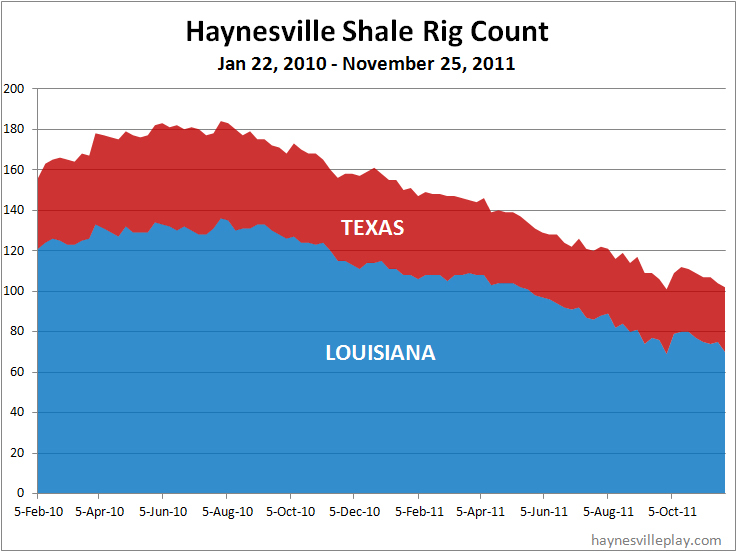 By type, horizontal rigs were up eight to 1,155, vertical rigs were down nine to 632 and directional rigs held at 213. 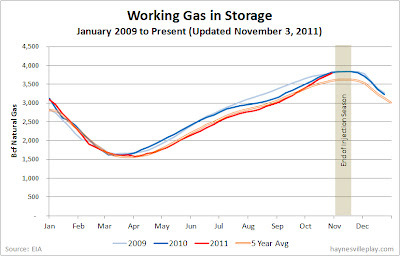 Thw weekly EIA working gas in storage report showed a 9 Bcf increase from last week's revised level to 3.852 Tcf. The level is only 2 Bcf above the pre-revised level reported last week. The weekly injection was 16 Bcf higher than both last year and the five year average (both a net withdrawal of 7 Bcf). The current level is 23 Bcf higher than last year and 233 Bcf higher than the five year average. Private equity company KKR announced today that it is leading a group that has struck a deal to acquire the majority of Samson Resources' assets for $7.2 billion. Only Samson's Gulf Coast and Gulf of Mexico properties were excluded from the deal because they would be more attractive to larger producers than a PE company. The transaction does include Samson'S Haynesville Shale properties. I wanted to wish everyone a terrific Thanksgiving. I'll be traveling this week, so this space will be relatively silent until next weekend. Each year at Thanksgiving, I try to reflect on the things for which I am thankful. But it always seems to come back to the people, not things, that I truly value. Nobody gets to be who or what they are without the support and influence of the those around them. And while I'm giving thanks, I want to thank all the folks who read this site, especially those who offer their thoughts (and occasional criticism). I created this site for myself, but I am glad that so many others find the information helpful. Happy Thanksgiving to you all! 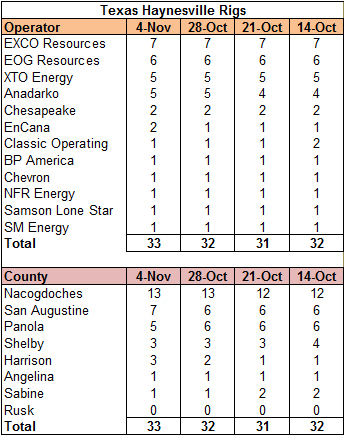 The weekly Haynesville Shale rig count dropped by three this week to 105. The count was up one in Louisiana to 76 but down four in Texas to 29. For fans of the Smackover Brown Dense in Louisiana, look for the XTO well ExxonMobil 2H #1 to start drilling in Morehouse Parish at the beginning of this week with a total permitted depth of 13,000 feet. The Baker Hughes U.S. rig count declined by 15 rigs to 2,001 this week. Oil rigs were down eight to 1,125, gas rigs were down six to 871 and miscellaneous rigs were down one to five. By type, horizontal rigs were down five to 1,147, vertical rigs were up eight to 641 and directional rigs were down 18 to 213. Today, EXCO Resources announced its 2012 capital budget. The company will spend $710 million on capital projects, $585 of which will be devoted to well drilling and completion. Of that $585 million, 79%, or $460 million, will be devoted to the Haynesville Shale. The 2012 capex budget should cover 98 gross Haynesville operated wells (30.3 net), a small net number of non-operated wells and some completions activity related to 2011 drilling. Next year, the company will run 13 rigs in the Haynesville Play, a decrease from the 18 to 20 rigs it ran in 2011. EXCO will devote eight of the rigs to the Holly Field in DeSoto and Caddo Parishes and focus on concentrated development using multi-well pads on an 80 acre spacing basis. The remaining five rigs will drill in the Shelby Trough area of Nacogdoches, San Augustine and Shelby Counties, where the company is still delineating acreage and testing well spacing. HBP activity should be completed in 2012. QEP Resources held its analyst day on Monday and provided details about 2012 and the company's strategy (presentation for southern region, Haynesville starts on page 15). As indicated last month, the company will see a "significant Haynesville capex (capital expenditure) reduction until gas prices improve. As with nearly every other domestic producer, QEP will focus on oil and liquids in the near future. The company expects liquids to rise from 11% of the company's production in 2010 to 20% in 2012. In the past two years, QEP has budgeted $410 million for capital spending in the Haynesville. In 2012, that figure will drop to $290 million. 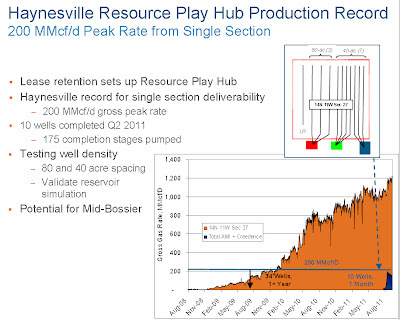 Management also spent time explaining Haynesville well economics. QEP is seeing well costs come down to an average of $9.1 million. The company is still quite high on the restricted choke technique in which initial production rates are limited to help boost ultimate recoveries. QEP is booking estimated ultimate recoveries at 6.1 Bcf and with the restricted choke technique is seeing initial decline rates of around 50%, which is considerably better than the 80% companies were seeing in past years. 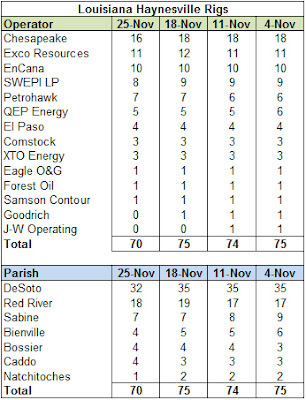 Bottom line is that the Haynesville represents a very big gas play for QEP, but now that it is no longer trying to hold leases in Louisiana the company is patient enough to let it ride with a lesser capital investment until gas prices improve. 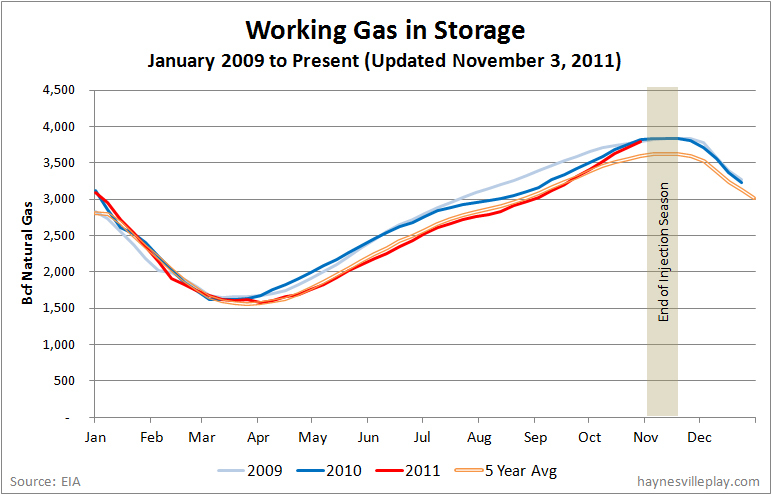 The weekly EIA working gas in storage report showed a 19 Bcf increase, bringing the total storage level to 3.85 Tcf. 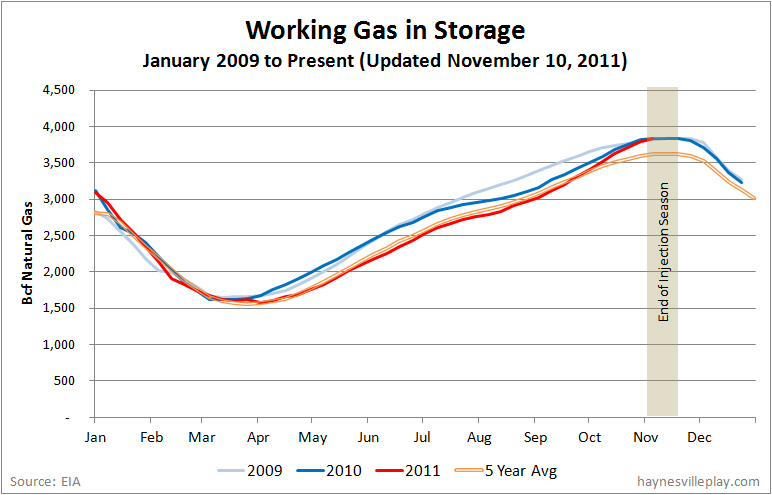 The current level is a record high, unfortunately not the kind of record that the gas industry wants to be setting. The weekly injection was 20 Bcf higher than last year and 9 Bcf higher than the five year average. The current storage level is 0.4% higher than last year (the first time it's been higher since March 2011) and 6.2% higher than the five year average. Temperatures last week were normal, only 0.3 degrees below average. Maps and spreadsheets are now updated with current information. BHP Billiton, the Australian company that acquired Petrohawk a few months ago, released an investor document earlier this week that makes a very articulate case for shale gas. The presentation (see pages 7 to 27) gives an excellent graphical overview of the technology behind shale and proceeds to talk about what scares people abut hydraulic fracturing. It ends by making a compelling argument for shale gas in North America. If you are at all foggy about the process, it's a very illuminating and relatively quick read. 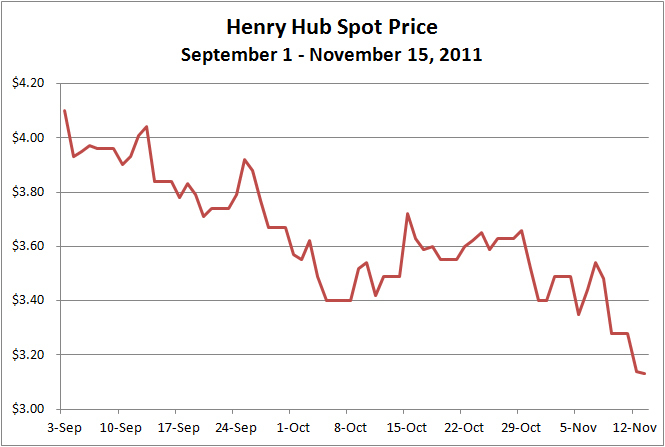 The Henry Hub spot price for natural gas has taken a tumble in recent months and especially in the past few days. 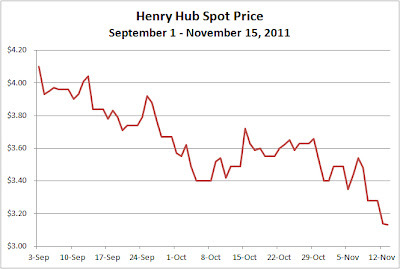 While the price has sucked wind for the past three years and has been lower than the current level during that time, the price has dropped 11.6% since last Wednesday. It closed at $3.13/MMBtu this afternoon. Low commodity prices are common this time of year while the market waits for storage levels to be drawn down instead of increased. I'm sure the price drop has everything to do with the upcoming storage report, which probably will record a new record high, and the relatively mild weather across the country, which is not likely to be a big draw on storage levels, but it is still nauseating to watch. The current price actually makes $4/MMBtu actually look attractive, and that's pretty hard to do. The weekly Haynesville Shale rig count was unchanged last week at 108. Louisiana was down one to 75, while Texas was up one to 33. This week, Encana discussed its Resource Play Hub concept, also known as the gas factory, in a Haynesville-centered conference call. Coincidentally, or not, the company reported a slew of completions in the vicinity of its experimental Haynesville pilot hub in Sec. 27/Township 14/Range 11 (ten new completions are listed at bottom of post). The company drilled eleven wells to test the section, experimenting with 40 acre and 80 acre spacing. The initial production rates of the eleven wells exceeded 200 MMcf/day - not too shabby. There were only two new Haynesville Shale drilling applications filed in Texas over the past week (11/2/11 - 11/8/11), and both are to be drilled on the same well pad. Since permits are a leading indicator of drilling activity (although not perfectly correlated), this appears to be a negative sign for the Haynesville Shale. But it is always dangerous to extrapolate a trend from a single data point, so I looked back over the past thirteen weeks of Haynesville permits. Over that period, there were 5.3 new permits per week. Looking back over the past six weeks, that number dropped to 4.4 new permits per week. That may be a sign of slowing activity. In an editorial in the New York Times last week, conservative columnist David Brooks expounded upon the "blessings" of the shale gas revolution in the U.S. It's a good article that gives an overview of shale gas and talks about the current politics and issues. Among the issues Brooks notes is the impact that shale gas has made upon the chemical and manufacturing industry. I think this issue has been overlooked as a positive impact of shale gas. Before shale gas extraction became feasible, chemical companies were closing U.S. facilities and relocating them offshore where natural gas prices were lower. Now that feedstocks look to be cheaper for a long time to come, we are slowly starting to see new investment in facilities in the U.S. This means lots of capital spending and jobs, both in construction and operations. These are good jobs that were evaporating five years ago. No stimulus, no subsidies, no bailouts, just market-driven jobs and investment. A handful of Louisiana officials met recently with natural gas industry representatives to look at the possibility of creating better fueling infrastructure for compressed natural gas (CNG). The meeting took place in October and was led by Public Service Commission chairman Jimmy Field. This effort seems natural given the large quantities of gas produced in Louisiana, but it will inherently not be market-driven endeavor and likely will require government-driven economic incentives, which are not politically popular in the country these days. Looking at a short list of officials in attendance, all were Republicans (I'm not sure there are any Democrats left in Louisiana these days), so the good news is that any effort to create CNG infrastructure likely won't involve a partisan battle. The weekly Haynesville Shale rig count was down one rig to 108. The count was down one in Louisiana to 76 and unchanged in Texas at 32. This week, Chesapeake Energy announced that it has signed a letter of intent with "an undisclosed international major energy company" for a joint venture in the Utica Shale in eastern Ohio. The deal gives the new investor a 25% interest in around 650,000 net acres in the wet gas area of the play. The acreage is currently owned by Chesapeake (570K net acres) and EnerVest, Ltd. (80K net acres). The deal values the acreage at $15,000 per net acre, and will yield $2.438 billion to CHK and EnerVest. CHK's $2.14 billion proceeds will be paid $640 million in cash at closing and $1.5 billion in carried drilling and completion cost. The company also announced a transaction to sell up to $750 million of preferred shares for acreage the company owns in the Utica Shale. You can read all about it (starting in paragraph four) because it just wears me out to try to understand and explain Chesapeake's funding deals. The weekly Baker Hughes U.S. rig count showed a five rig increase, bringing the number of working rigs to 2,026. 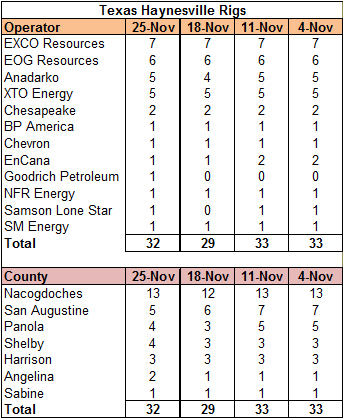 Oil rigs were up 34 to 1,112, gas rigs were down 27 to 907 and miscellaneous rigs were down two to seven. By type, horizontal rigs were up two to 1,157, vertical rigs were up three to 626 and directional rigs were unchanged at 243. But I posted updated spreadsheets and maps bringing all data current. England's pursuit of shale gas hit a roadblock a few months back when two minor earthquakes (2.3 and 1.5 on the Richter scale) around Blackpool were attributed to the hydraulic fracturing of Caudrilla Resources' Preese Hall-1 gas well. Caudrilla ceased fracking operations at the well and performed a study to determine the cause of the seismic activity. In a press release yesterday, the company said that it found that it was "highly probable" that the fracking operations triggered some seismic events. But the study also found that it was an "extremely rare" set of geologic circumstances that led to the seismic activity that would be unlikely to reappear in future well sites. Unfortunately, Caudrilla found the needle in the haystack, and the nascent gas industry in the U.K. and Europe will pay the price. The findings will fuel the call for bans on fracking in Europe, even though the events are unlikely to repeat themselves. Will it be enough to derail the pursuit of shale gas? The U.K. is particularly aware of the need for readily accessible, affordable energy, so the debate will rage on. 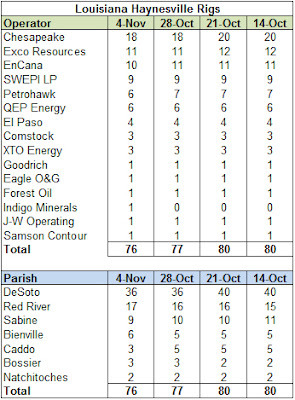 The seven wells drilled in 2010 have produced at an average rate of 8 MMcfe/d during their first 240 days of production and, at the end of the 240 days, had an average flowing pressure of approximately 4,300 psi. Forest now believes that the estimated ultimate recovery from these wells should exceed the 6.5 Bcfe type curve. The company also noted that it expects cost reductions and efficiencies to further enhance Haynesville returns. While one new rig is not big news in and of itself, it is a positive indicator that the Haynesville Play has a bright future. The only knock on the play is that it produces only dry gas and the commodity price for gas is terrible without much on the near-term horizon to suggest otherwise. A big knock, yes, but the Haynesville's fundamentals are strong. Samson Investment has entered into exclusive negotiations with LBO firm KKR to acquire a majority of Samson's oil and gas assets (Bloomberg; Financial Times). Word is that KKR is proposing a $5 billion investment for majority control of the company, but it would need selling shareholders to provide additional financing in the form of retaining a minority share for the deal to work. Reports have suggested a valuation of $8-10 billion for these assets. This deal is in KKR's sweet spot and the deal. If the deal is consummated, it might might work out very well for the selling Schusterman family as well, giving them two bites at the proverbial apple. KKR has made several acquisitions of shale assets and turned around to resell them at a higher price in a short time frame, usually to a major producer (i.e. East Resources to Shell, Hilcorp to Marathon). 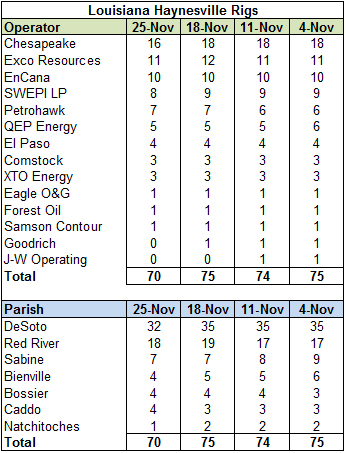 By my count, KKR is sitting on some Barnett Shale assets. Might there be some form of packaging to create a larger follow-on deal? KKR also has a midstream joint venture with El Paso. Hey, isn't El Paso's E&P business for sale too? Hmmm. So far, KKR has exhibited a golden touch. Let's see if that hot streak continues.